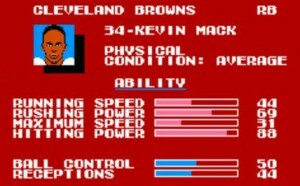 Kevin Mack was one of the most devastating runningbacks in Tecmo Bowl. He was what we called a ‘popcorn back’ and he was a one man wrecking machine that you dared not tackle alone. If you had the fortune of steering the ‘Mack Attack’ you just had to hit that A button non-stop to pay dirt. As an Oilers fan, Kevin was the last guy I wanted to see. 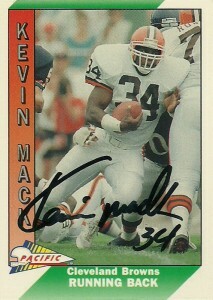 Originally a fullback for the Los Angeles Express of the USFL, Mack would rush for 330 yards and 4 touchdowns in 18 games. The Browns saw something in the former Syracuse back and took him in the 1st round of the supplemental draft for USFL players in 1985. His rookie season was his best, as the team leaned on ‘Mack Truck’ for 1100 yards where he’d play in the Pro Bowl after the season. In 1986 he had a career high 10 touchdowns and in 1987 he averaged a bit over 60 yards rushing a game. A sturdy short yardage presence, Kevin crushed defensive linemen and linebackers with well-proportioned 6″, 212 pound frame. 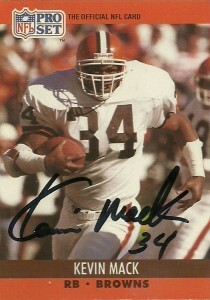 Mack would always kill either the Oiler’s playoff hopes or their divisional championship dreams- including a backbreaking rushing touchdown in the waning weeks of 1989. These cards really represent Mack’s downhill running style well and the Stadium Club and ProSet card of him are among my favorites. 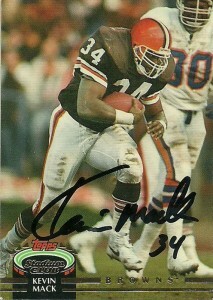 I sent off for his autograph from the Browns organization and he responded quickly to my request in roughly a month. He currently works in the team’s front office.